HONG KONG—Nov. 19 is the ninth anniversary of the publication of “Nine Commentaries on the Communist Party,” an editorial series by Epoch Times that is banned in China. The book immediately filled an urgent need for the Chinese people by giving them an uncensored history of the violence and lies of the Chinese Communist Party (CCP). It also sparked a movement called “Tuidang” (quit the Party) that has a special place in Hong Kong. Many Chinese people have quit the CCP after reading the “Nine Commentaries,” and the total number of people who have renounced their ties to the CCP and its affiliated organizations has now reached 150 million. People often quit in person at Tuidang Centers, which are often simply a table and some posters. Hong Kong is regarded as the frontline for quitting the Party and has 20 Tuidang Centers placed in popular spots throughout the city. With almost 100,000 arrivals in Hong Kong from the mainland every day, these Tuidang Centers stay busy. One Tuidang Center volunteer, Ms. Liao, is over 70 years old. She is a practitioner of the traditional spiritual practice Falun Gong, which is persecuted in China, and is a native of Hong Kong. For eight years she has spent her time volunteering, rain or shine, to persuade people to withdraw from the CCP at the Tuidang site in East Tsim Sha Tsui. Ms. Liao tells about what Falun Gong (also known as Falun Dafa) is and why it is persecuted. She believes if people understand the situation faced by Falun Gong practitioners in China, then they will be more likely to want to renounce the CCP. Hong Kong is very hot during the summer, with temperatures of 30 degrees Celsius (86 degrees Fahrenheit) or higher. Some tourists are moved to tears when they see Falun Gong practitioners working hard under the burning sun, and some shake hands with Ms. Liao to express their respect. She said that quite a few of them are high-ranking officials from China, and some of them are Chinese police. 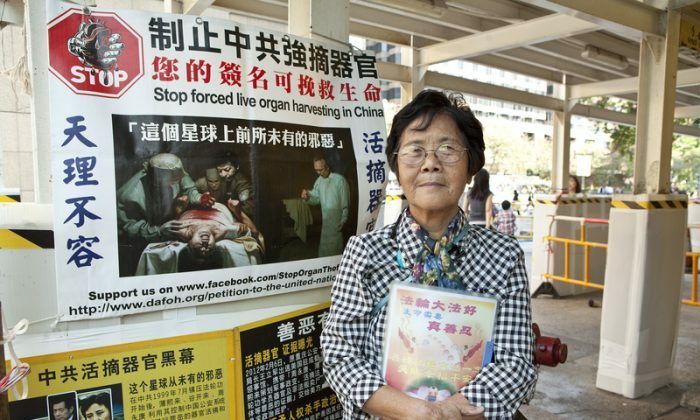 Ms. Liao tells tourists about the disgraced former Politburo member Bo Xilai and his wife Gu Kailai, and how both were involved in the CCP’s cruel practice of harvesting organs from living Falun Gong practitioners. This helps the Chinese people to better understand the CCP’s evil nature and motivates them to quit the Party. “You may not be aware of the happenings in China,” Ms. Liao says to tourists via her amplifier. “Now the CCP is treating truthfulness, compassion, and tolerance [the three main principles of Falun Gong] as its first enemy, harvesting organs from kind Falun Gong practitioners, turning doctors who should help people into evil killers, and turning surgery knives into weapons to kill people. Many tourists are paying attention to the cruelty of organ harvesting, curious about Falun Gong practitioners’ statements on the subject, according to Ms. Liao. Every day for the past year, dozens of people have quit the Party at the East Tsim Sha Tsui site in Hong Kong. Sometimes, over 1,000 have quit the Party in a single week. Another volunteer, A-nong, comes to the Wan Chai Pier every evening to urge people to quit the CCP. While tourists swarm onto the ferry, volunteers are busy around them. A-nong said that dozens or even hundreds of people quit the Party daily, especially this past July and August. In the past year, the Jiang Zemin faction of the CCP paid some secret agents to form a pro-communist group called the Hong Kong Youth Care Association. The group kept harassing and suppressing Falun Gong practitioners, but practitioners stuck to the principle of never fighting back or talking back. More and more Hong Kong people are standing up for Falun Gong. A-nong said that, thanks to the disturbance caused by the Youth Care Association, even more people are choosing to quit the Party now. Translated by Amy Lien and Rebecca Chen. Written in English by Sally Appert.